I never know how one of my recipes is going to be received. Sometimes I’ll think I’ll have a “good” recipe. It has great photos and tastes amazing. I’ll hit publish and do all my social sharing and wait. I hope that it will do well on Pinterest and Facebook and people will be interested in it. Sometimes that just doesn’t happen no matter how much you promote it. You can’t fake viral. It just happens. The cool thing is that you don’t have to be a professional photographer to have a recipe perform well. Some of my most popular recipe posts have horrible pictures, yet people love the recipe. I think the recipe itself is the key. You need a recipe that people want to make. I took a peek into my Pinterest analytics to see my top recipe pins of all time. My Cabbage Roll Soup was the #1 recipe post of all time (so far, anyways!). I thought it would be neat to see what some of my blogger friends recipes were doing well so I asked them to have a look at their most popular recipes. I’m calling them “recipes gone viral”. There are a good mix of recipes from desserts to snacks to seasonal treats. 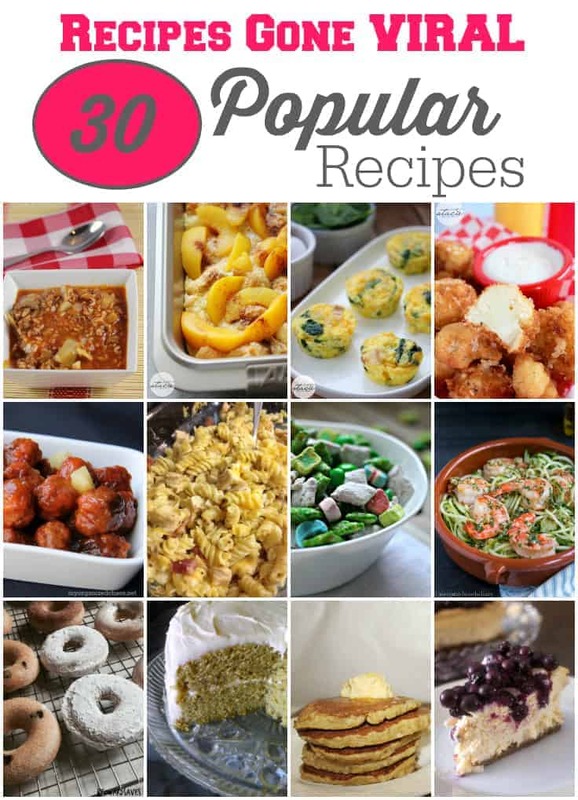 Have a peek at these 30 popular recipes and if you like any, make sure to pin them! I recognize some of those recipes from various blogs! Well! I needed something to bake today and now I will be off to try the donuts and possibly the chili for supper!! Thanks!! I know I have a couple of these pinned but I will have to check out some of the other ones; thanks for sharing. Awesome list! I’d love to try the Loaded Baked Avocados! I wish blueberries were common in my country. Although we produce it, they are expensive. Lots of new meal ideas to try! thank you! Some pretty awesome recipes, I love the cheesecake ones, yummm!! Almost everyone of these recipes looks amazing. Will pin cabbage roll soup! Vegetable dip shooters are on my must try list! thanks! I couldn’t pick just one so I picked two, My Curry Chicken from nickisrandommusings.com and the Skinny Homemade Donuts from livingsweetmoments.com. Thank you for sharing this list of recipes. You’ll love the curry chicken if you make it. It’s so easy and super delicious. Happy eatings. Thanks for sharing these great recipes and links , I will be pinning! I am going to try the Parmesan Potatoes as they look so good! Thanks for including mine and for all these awesome recipes, I am heading over to pin every one! Yum, so many great recipes! I have to get pinning. Thanks for sharing my Hashbrown Hamburger Casserole with Veggies and Cheese recipe!! Thanks for including our yeast rolls recipe. I can’t wait to try the others! Wow! What a list. The muddy buddies was the first click then I kept clicking. Great compilation!